Updated 9/21/18. “Help! 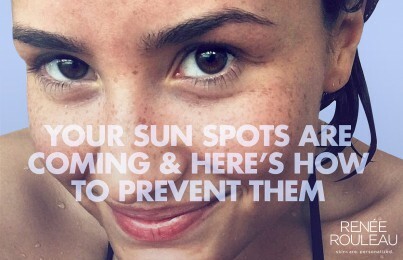 I wore sunscreen religiously all summer and my face still got covered in freckles and sun spots!” Sounds familiar? How can someone be so good about wearing sunscreen, a hat and mostly staying in the shade all summer find their skin with unwanted discoloration? The answer is simple. It’s the heat given off by the sun that causes melanin cells (melanocytes) to produce more pigment in an effort to protect the skin from inflammation. The goal is to get the pigment cells to settle back down so that the sun spots and freckles will fade away and the skin can return to being bright and even-toned again. 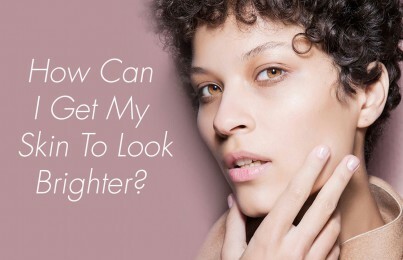 It’s important to know that while it can eventually lighten up over time, discoloration needs to be treated with high-powered active ingredients and professional treatments to get it to go away quickly. 1. Jump on it — fast. It’s important when sun spots and freckles occur, that you act quickly. Skin cells have a memory, so the longer they are there without you doing anything to get them to settle down, the longer it may take to get them to go away if you decide to do something about it later. 2. Discontinue use of a sonic cleansing brush (Clarisonic) or at-home micro-needling. This may come as a surprise but repeated aggressive friction from needles and bristles may prevent the melanin cells from settling down. It’s best to put all of these on hold for the moment to avoid any unnecessary inflammatory response—to skin that is already inflamed as evident by sun spots. Read my review of home care devices. 3. Avoid overheating the skin. Since we want pigment cells to settle down to get rid of sun spots, doing activities which can raise the internal temperature of the skin, is not a good idea right now. It’s best to avoid outdoor exercise, hot yoga, steam rooms, and saunas. If you should find your skin getting red and over-heated, keep a gel-based mask in the refrigerator and apply it to the skin and leave on for 20 minutes to cool the skin and provide relief. 4. Use the pigment-reducing skincare to get rid of sun spots. There are four active ingredients to get rid of sun spots and discoloration. Cleanse the face with a mild sulfate-free gel cleanser and rinse well. Pat skin slightly with a towel. Immediately apply an alcohol-free toner and wipe over the entire face. Leave damp. Immediately apply a thin layer of a vitamin C serum (like Vitamin C&E Treatment). (This step is extremely helpful as vitamin C is excellent for inhibiting melanin cells to encourage fading of discoloration. Essentially, it acts as a natural skin lightener. For the best results, use one with the ingredient tetrahexyldecyl ascorbate which is a stable form of vitamin C known for its proven ability to fade brown spots, without causing skin irritation. Wait 60 seconds and then apply a generous a layer of sunscreen to block out damaging UV rays. Apply either a foundation makeup or mineral powder makeup. Especially for skin types prone to pigmentation, I never suggest you go makeup free during daylight hours. The fact is, wearing makeup (appropriate for your skin type) offers a barrier of protection against harmful UV rays. UV rays from the sun are the #1 reason for skin aging. It’s not genetics, smoking, and believe it or not, even age. The sun is the skin’s WORST enemy. Most types of makeup contain sunscreen and even if they don’t indicate an SPF number, most have UV-protecting ingredients like Titanium Dioxide. Based on this benefit from wearing makeup, I never leave my skin bare and never suggest my clients (with or without hyperpigmentation issues) to do so either. So do your skin a favor and start wearing makeup NOW, to protect your skin from wrinkles in your future. Cleanse the face with a lotion-based cleanser to effectively dissolve and digest off makeup and debris. Immediately apply a gentle exfoliating acid serum (like Pro Results Power Serum) for two nights in a row. Look for one that contains glycolic, lactic or malic acid, which will help dissolve pigmented cells. After two nights, discontinue the acid serum and use a serum with retinol (like Advanced Resurfacing Serum) on night #3. On nights #4 and #5, use the vitamin C Serum from the morning as your evening serum. Then repeat the whole process starting back with the acid serum. Using a variety of different ingredients (acids, retinol, and skin-lightening vitamin C) are all working to eliminate unwanted discoloration. Wait 60 seconds and then apply a soothing, anti-inflammatory moisturizer appropriate for your skin type. 5. Use a prescription skin bleach, if needed. 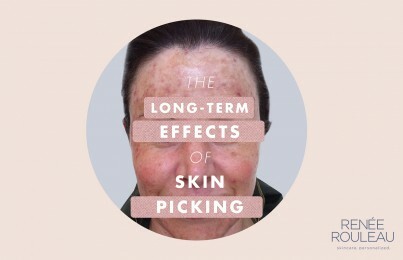 In some cases, a compounded skin bleach used several nights a week may be necessary to remove more severe pigmentation. I usually suggest to most of my clients to wait a few weeks to see how the combination of the acid serum, vitamin C serum, and retinol serum work before I’ll recommend they get a skin bleach. They need to be prescribed by a dermatologist but can be custom-blended from a pharmacy. A great example of a compound uses 8% hydroquinone, 1% kojic acid, and 1% vitamin E. (There are ready-made prescription bleaches available like Tri-Luma but because compounds are custom-made, they can really cater to the skin type and severity of pigmentation. Note: Hydroquinone should not be used for long periods of time. Be sure to follow the instructions for usage as recommended by your doctor. 6. Get a professional chemical peel or intense pulsed light (IPL) treatment. In many cases, at-home creams and serums will only do so much and a professional procedure is needed to get the skin looking clear faster. My favorite treatments for this condition are Bio Brasion (the next generation of microdermabrasion) combined with a chemical peel. (You can see the amazing results from my client, Natalie who had a bad case of discoloration.) Peels are very powerful for removing deeper pigment but of course, the type of peel needed for each type of skin may vary. IPL is also a popular choice for targeting the sun and heat-induced discoloration by lifting out pigment from the cells. If you do decide to seek the help of a professional, be sure to get a good referral and seek out someone with a lot of experience performing these types of procedures. 7. 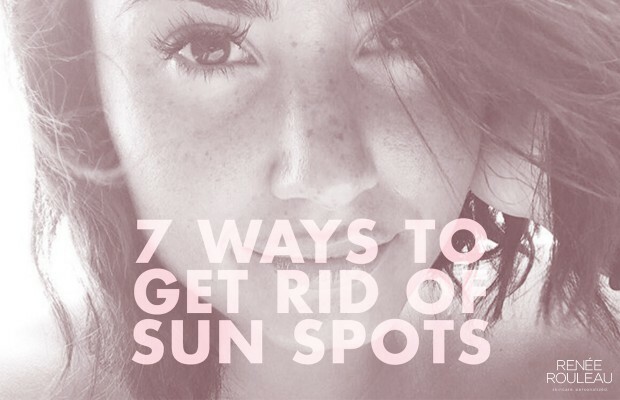 Prevent sun spots from returning. Just because my program can help return the skin back to being even-toned (or at least to what it was pre-summer) doesn’t mean you can start to slack off with your routine. Once you have a tendency for it to occur, it will slowly come back. The best way to prevent discoloration from returning is to limit time away from heat and the sun, wear sunscreen faithfully, wear a wide-brimmed hat when outdoors to avoid overheating the face and continue to use a home care routine with vitamin C, exfoliating acids and retinol. (And a prescription skin bleach, when necessary.) Also, I highly suggest getting a skin-brightening facial every six weeks where an esthetician will use a professional-strength exfoliating acid as well as vitamin C to ensure the skin stays smooth, glowing and even-toned. For an at-home chemical peel, I suggest for my clients to use Triple Berry Smoothing Peel which has a blend of five exfoliating acids and works very well when used 2-3 times a month to keep pigment cells away to give a bright look to the skin. In addition, you can also give your skin a stronger form of exfoliation with this DIY chemical peel using a prescription retinoid. In conclusion, developing hyperpigmentation on the skin during the summer months and from a beach vacation can be very common but with the right products and treatments (along with patience), can get the skin returned back to its beautiful self in no time. You simply just need to put in a little work.